As director of National Programs and Site Development at the National Writing Project, Elyse Eidman-Aadahl oversees national learning networks and professional development programs for nearly two hundred university-based local writing project sites. A learning environment expert and education advocate, Elyse is dedicated to improving the teaching of writing by helping educators understand the changing nature of the discipline in a digital age. After watching writing teachers adapt to rapidly changing digital environments for more than 15 years, Elyse saw that many were hungry for an opportunity to explore the intellectual threads of their work in a community of practice. 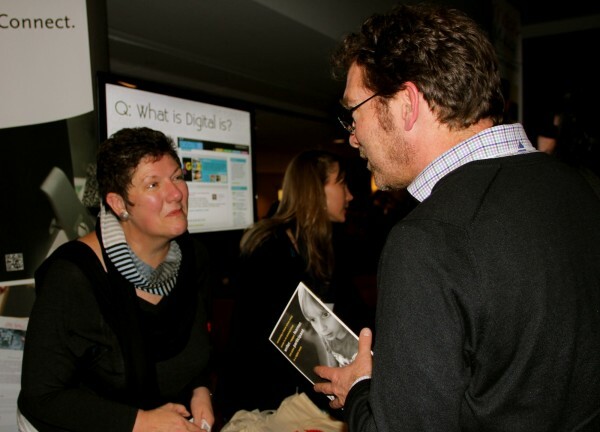 Seeing a need for a space where educators could have deep conversations about changing writing and teaching practices, Elyse and her colleague, Christina Cantrill, co-founded the Digital Is website in 2010. The website is a curated collection of ideas, reflections and stories from mentors and educators across all grade levels, K-16, who are exploring the teaching of digital writing. We spent a few minutes with Elyse to ask her about the writing revolution taking place in the 21st century and how educators can begin to prepare youth for a future in digital writing. By definition, what does it mean now, in this tech-heavy world, to “write” and be a “writer”? To write still means to make something. Writers are makers. Only when we write, we’re using the very powerful tools of language and symbol systems. The fact that writers make things like texts and videos is really important to remember because much of the power of writing is that it takes thought and externalizes it so that the writer can get distance on it. That alone is an amazing part of writing since we can be learning draft-by-draft, piece-by-piece. That struggle to know and to express continues whether we are writing on a digital platform or in our spiral notebooks. There is a core to writing that is still about creating and sharing knowledge. That does not change. However, there are some components that have hugely changed, mainly the issues of what we can create and how it circulates. For those of us who went to school before the advent of digital tools, we wrote words on blue-lined paper and handed our finished products into our teacher who acted as the sole reader of our material. That first solitary piece was what we thought of as writing. You can see this exact thing even for the professional writer. How a Book is Made depicts a 1950s man who has just completed the final page of his manuscript. He takes it out of the typewriter and places it in the box and hands it in. Then you see a chain of people who are responsible for turning it into a book that can be distributed. produce the text but also to design it, circulate it, and manage publicity as well. And since this happens cheaply on the internet and with low barriers of entry for new digital media-making software, even very young or beginning writers can actually participate in all of those processes. They do it all the time in social networks and sharing sites. So that means now that the notion of what writing is can become very expansive for all of us. The role of the writer has changed, as has the text he creates. But what exactly is digital writing? At the National Writing Project, we think of digital writing as writing that is not only created using digital tools, but is also typically created in or for a networked environment and meant to be interacted with on a screen. And that all sounds so new to many people, but it really characterizes a huge amount of the reading and writing we do in our everyday lives. Actually, teachers of writing have always been interested in the question of what the computer can do for their discipline starting way back with word processing. As computers become increasingly networked, teachers could see the potential for the read/write web, for writing as a way to participate in online communities, to hyperlink vast amounts of information connected to a text, and to interact and even collaborate directly with others to create something. Of course, we still read and write more traditional texts. But the innovations of the last 20 years represent quantum leaps in our thinking about what it means to read and write. It’s very important for us to build this into our understanding of what it means to teach writing. We need to be able to make that part of our understanding of the new normal of writing — not an additional piece — but the new normal. How important is it for teachers of writing to begin rethinking their roles during this transformation? I think this is an incredibly exciting time to teach writing. We have the chance to participate in this redefinition of our core discipline. Nobody has the answers to where this is going, and by being a writer yourself and participating in digital environments alongside the youth you work with, you are able to observe patterns and experience the new in such a way that you could be part of remaking knowledge in the field of composition. The writing revolution is not done and we can be right in the middle of it. So for teachers’ roles, it’s all about an inquiry stance and creating learning experiences where students can do the same because the “textbook” is all around us in the reading and writing going on in the world. It comes down to participating as a digital writer and deeply reflecting upon your work by looking for patterns and understanding what shifts are being required of you. The teacher gets to shift from being the person who hands out formulas for writing success to the person who stands shoulder-to-shoulder with the students to understand what happens when we write for real in world. That can be pretty engaging for teachers and students alike. Another role shift comes as teachers and students work together to not only to write and design texts, but also to build the platforms for publishing and circulation of student work. One good example of this is Youth Voices, a school-based social network that was started in 2003 and is collectively managed by a national set of teachers and student leaders to support youth publishing. Teachers and students have built this together in their writing classes. Are there key elements educators need to be aware of when rethinking their roles? It’s vital for teachers and curriculum developers to start with the assumption that every young person not only can become a participant in the public internet, but will become a participant and likely already is a participant. If you look at every kid in your classroom and you say it is not a choice — it will be their world — two things will come from it. First, youth are going to have to manage their online identity. How they present and represent their identities and manage the multiple footprints they leave on the web are going to be key things for students to understand. That part of what it means to write today. Writers can develop a sense of responsibility around what they put out there. It’s a kind of responsibility that I actually think is a good thing, not a burdensome one. Having a sense of power and authority behind one’s actions is so important in writing. If we think about the word author and hear its connection to the word “authority”, that authority carries exciting responsibility. Youth develop that responsibility by making, creating, and collaborating about real work that matters to them whether they are in school or out. A teacher in our network whose classroom really exemplifies this mindset is Joel Malley, a high school English teacher from Cheektowaga, NY. 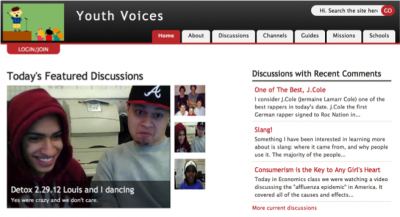 Students blog on a social network Malley created for his classroom. They also produce films, podcasts, and other digital media about issues they are interested in, and they share their final projects during end-of-project screenings. His high school classroom is a great example of the kinds of work going on in our NWP classrooms. With so much focus on media creation, how can we ensure core writing and development skills don’t slip through the cracks during this process? We were once in a phase – and we are coming out of it now — where digital tools and platforms were so new and were thought to be so challenging that the fact that somebody used them at all was enough to hand out praise. In a class of students where some write traditional papers and one student comes in with a digital story, perhaps we didn’t push that student who is working in the digital space in the same core elements of literacy because we were wowed by fact that he used technology. As a result he got a pass on all the other important elements. But now we can see that the tools are not the issue and, in fact, they are becoming ever easier to use. They allow us to do new things and expand our capacity to make things, yet deep, consistent issues remain at the center: what am I saying? Is what I have to say warranted? Have I been accurate and credible? Have I crafted something that my reader and my audience can take in? Am I listening to response and looking at my drafts iteration by iteration? The writing doesn’t get any easier just because we are not doing it with a pen and paper. Even when mechanical creation is easy, it’s so important to slow oneself down and to take one’s text quite seriously. It’s not about how pretty or glossy the final product is. If we don’t hold on to that in writing instruction — the search for meaning and communication in relation to context, purpose and audience –then we will lose a tremendous thing. What got you hooked on writing? I remember some explicit moments, especially as a teen, where I really tapped into a notion that by writing, I was learning something that I didn’t know before. Through both my personal writing and exploring questions that mattered to me in a learning journal, it clicked for me that writing was the engine for developing a new understanding. I was experiencing that power of writing has of taking the noise in our head and making it external, and I saw that I had shaped my mind by writing. When I became a teacher, I wanted my students to work as real writers where they would follow an interest to make something new and original and put it put out there, not because it was part of some assessment-driven learning, but because we’d want to read each other’s writing and learn together as members of a writing community. We used each other’s work to move forward with our learning. Writing is a kind of making that can be a driver for a student to connect her interest-driven learning with valued academic outcomes and social connections. Those experiences opened a window for me into how education in general can change in the classroom.